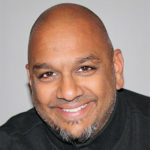 Chief diversity officer at MESH Diversity, Dr. Leeno Karumanchery is a sociologist with a Ph.D. focused in equity studies and 20-plus years of experience in the field of diversity and inclusion. Leeno is fairly widely published and does his best to combine his education, research and expertise as a facilitator and consultant to help organizations engage inclusion in a way that drives positive, pragmatic and sustainable change. Like so many other people of color who immigrated as infants, his experience living in Canada is more like that of a second-generation immigrant of color. Carrying no “foreign” accent, no great understanding of the “homeland” (beyond family stories), and perhaps most importantly, being a 48-year-old man, Leeno still experiences the occasional interaction that tells him some people will never truly see him as belonging. In this sense, while his biography is very much a standard immigrant story, it’s also a story accented by subtle oddities and awakenings, which are the strands of his own diverse tapestry. His maleness, brownness, heterosexuality, memories of an impoverished childhood buoyed by unconditional love—these unique strands are what drove him to study social justice and equity, and what informs both his personal humanity and his approach to helping others engage inclusion—they help to best explain who he is. Leeno collected comic books as a child and still does a little bit. His earliest memories around diversity, originating from his comics, seem to be why so very few, if any, of the superheroes, looked like him. In his head, it was just so simple: “How could I ever become someone good or important, if I never saw myself reflected in the world doing anything good or important? Anywhere? Ever?” So, he set out to understand those complexities, the world, and in the process, himself. Leeno immigrated to Canada at the age of one-ish, not old enough to have developed a sense of self or identity, but not so young that he would have been immune to the stark change in his everyday life. Born into a family of wealth and privilege now thrust into poverty and social exclusion, he lived the various traumas of their immigrant experience through his family. The intersection of the intergenerational trauma wrought by hundreds of years of British rule in India, with the class privileges of a wealthy Indian family that wouldn’t dream of working in the fields for a living, culminated in daily calls to stay out of the sun lest he gets dark. He learned, subconsciously, that brown is bad, and dark brown is really bad—creating his earliest memories of what marginalization felt like. Even through all of this, and more, Leeno and his family grew to understand the promise of the nation that received them, without welcoming them. Not surprisingly, social justice and inclusion became his life’s work, and that work is layered with the experiential lessons of exclusion, power, and privilege that frame his life. His 13 years of formal education honed his ability to understand and engage the deep science of this complex field from both quantitative and qualitative angles, but his lived experiences are what allow him to do the work with insight and heart. Leeno leverages these lessons to support organizations that are truly interested in bringing Diversity Intelligence™ into the mainstream of their culture and approach.